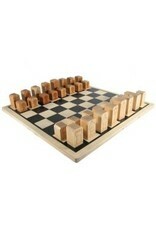 This instructional chess set is complete with 15" square by 3/8" thick hardwood board and 32 chess men. 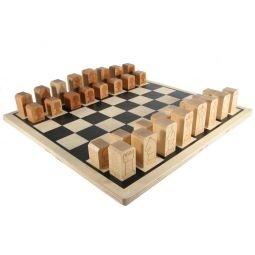 Each playing piece has its corresponding move pattern engraved its bottom. Maple "light" and cherry "dark" pieces measure approximately 1" square at the base and range from 1-1/4" to 2-1/4" tall.